Leadership is one a 5 key elements of our Growth Engine Model. Leadership custom and practice has been found to play a critical role in creating the environment and incentives for enabling the shift from good-to-great innovation performance. Companies and economies are constantly looking for ways to boost their financial returns. Today, innovation has become a top 3 strategic concern of business leaders according to IBM (2012). The leadership difference accounts for about half of the variation in performance across similar organizations: 15% directly from the leader and 35% from the choice of strategy. Launching new products, services or developing new ways of doing business are essential to realise that potential: Innovation is the best route to enduring financial returns and corporate renewal. And leadership is the thing that makes it happen. Innovation can be a fuzzy concept – but we don’t think that needs to be the case. Companies can respond to this challenge by building their Engines of Growth. Good Innovation Leadership is a key element of our Growth Engine Model because it has been found to play a critical role in creating the environment and energy for the leap from good-to-great innovation performance. Leadership provides the conditions, permission and incentives for innovation while organization structure and routines makes it flow. By Innovation Leadership we mean the process of creating direction, alignment and the commitment to create and implement something new that adds value. Creativity and the Leadership of it has been identified critical skill for corporate leaders in the 21st Century and a differentiator of company performance. Unfortunately, we give the collective business leadership community a B- on their innovation leadership report cards: Boards need to boost their concern for technology and innovation management issues and become far more involved as innovation activists. Leading innovation efforts means developing strength and depth in the leadership skill at four levels: corporate or business, the function, the team and at individual levels. At whatever level we chose, the three tasks of leadership in their Making New activities are about setting direction, creating alignment and building commitment. Yes, companies need to be efficient for today, but not at the expense of creating tomorrows cash flows. Business leaders must set up an organization that rebalances their concern for “Making of the New” activities from operational excellence to innovation. The evidence base shows that a special kind of leadership: creative leadership has a dominant positive impact on the innovative-ness of organizations and we should do everything we can to promote it through a company. Mediocrity Kills: Business leaders should continually develop their innovation bench-strength and should strive for no less than leadership in their sector – there’s just not enough energy in accepting mediocrity to overcome your own inertia. Think about your business and its innovation activities as a System and develop organizational routines that put Learning at the heart of your business. 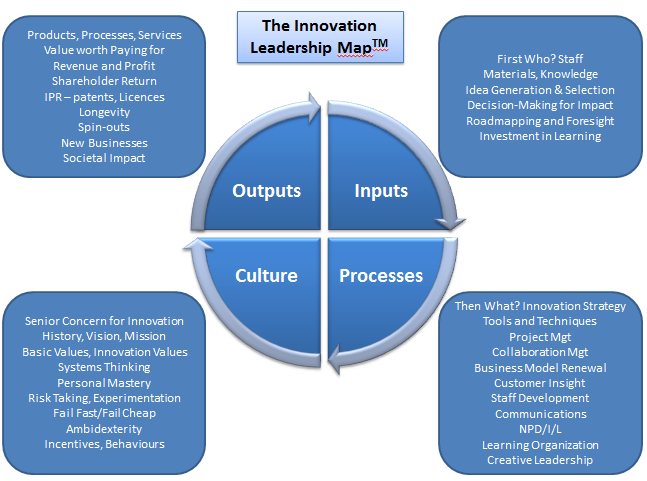 Our Innovation Leadership Map© tells us about what innovation leaders can do to create better innovation outcomes through managing the inputs to our innovation activities, the processes of managing and the firms operating culture. Make creating a climate for innovation a priority: Modify the organizational structures, demonstrate leadership behaviours and set compelling goals and provide resources. Become a board that practices “innovation activism” – innovation is about corporate renewal and that’s nobody else’s job. Create a “board of innovation” – populated with senior, experienced, disciplined, knowledgeable staffers to create, guide, resource and kill projects. Build an Organization capable of learning and unlearning: Practice the 5 disciplines of Systems Thinking. Build the companies innovation Bench Strength – populate it with the right people and let go the rest. Invest in those exhibiting personal humility and unswerving will to serve the greater interests of the company, venture or team. Create an environment for appropriate risk-taking and for “good” failure. When things do go wrong, make sure the lessons are learned and applied and above all, do not punish. Create top-to-bottom incentives that reward creating and delivering new ideas in the service of your customers; the financial returns will flow from that. Benchmark your innovation organization and aggressively focus on a limited set of improvements. Creative Leadership is acritical skill for corporate leaders in the 21st Century. Develop and select based on the ability to lead, creatively. Innovation is all about driving into new territory: and that very act brings some risk. It’s the special role of innovation team leader can make the difference in making innovative ideas a commercial reality. The innovation team leader wears two masks – one as team Coach and the other as Cheerleader and operator in the wider organization. 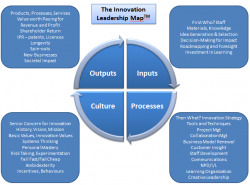 Innovation Leaders have a certain innovation management Toolset, Skillset and Mindset. Proactive the 5 Disciplines of Systems Thinking – team learning, shared visions, mental models and personal mastery will create better innovation project outcomes. Lead Creatively – construct the innovation team and work to elevate their want to out-perform using creative leadership. Work to develop a sense of purpose for staff, more than mission and vision, but a purpose about why should they go the extra mile a 2am in the morning. Leaders can build teams with thought diversity from differing approaches, thinking styles, and problem-solving approaches, functional diversity and encourage connective thinking and break down group think. Invest in the company’s innovation team leader bench-strength using experiences, selection, investment and incentives for this special individual to perform. We help organizations create an enduring capability to innovate and we truly believe that by creating and continually refining a Growth Engine you will see the way to significant improvement. Finally, we suggest that building a great innovation engine is not for everyone: it is a choice. If your business aspires to sector leadership we provide the means and ability to make that happen. Full report Available of Request.